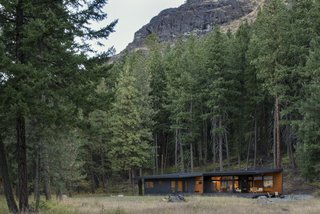 Nestled at the base of a dramatic rocky butte, a tiny cabin in the woods of Washington blurs the distinction between indoors and out. 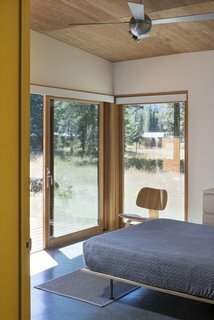 Towering ponderosa pines and a steep, boulder-strewn slope form a dramatic backdrop for the low-slung Chechaquo Lot 6 Cabin, a sleek retreat that seems to float atop a feathery meadow. 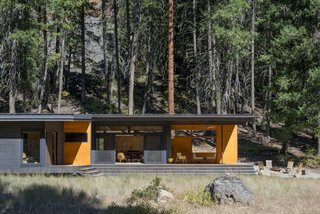 Seattle–based Prentiss + Balance + Wickline Architects designed the 1,100-square-foot cabin in Mazama, Washington, for a couple with a tight budget and a resolute passion for indoor-outdoor living. 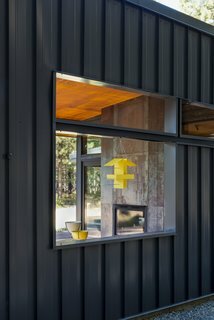 To help blur the lines between indoors and out, the team installed numerous Sierra Pacific aluminum-clad doors and windows throughout the home. "The idea was to break down the barriers between indoors and outdoors to provide a space that reflects how our clients live," explains the firm of the two-bedroom home. "The site itself was the inspiration behind the design, driving most of the decisions we made alongside the client." Windows emphasize the horizontal lines of the home and start to dematerialize its volume. 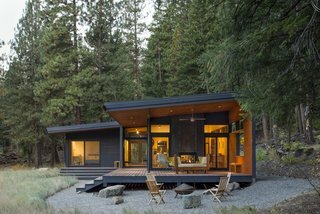 A predominantly timber material palette, large windows alongside glazed doors, and an expansive 785-square-foot wooden deck tie the cabin into the surroundings, while its horizontal massing and black exterior finish minimize visual distractions from the landscape. 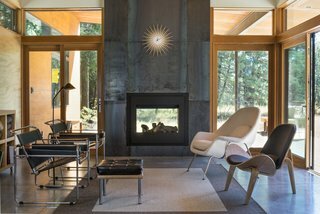 The clients' preference for midcentury-modern decor can be seen throughout the home, but particularly in the living room, which features a Hans Wegner shell chair and Wassily chairs. 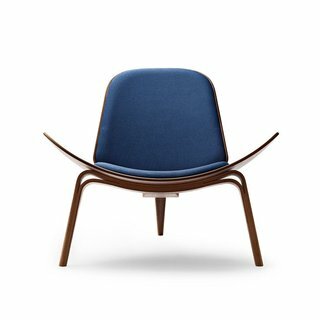 The public was initially reluctant to accept the three-legged CH07: Shell Chair—an edgier piece of work—from Hans J. Wegner, which debuted at the 1963 Furniture Guild Exhibition in Copenhagen. 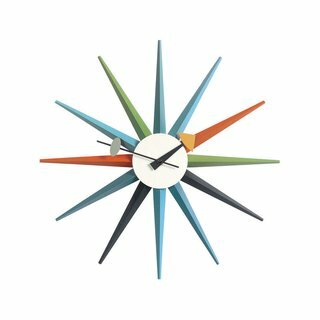 With the diversity of materials used and their sculptural shapes, Nelson's clocks embody the joie de vivre of the 1950s. To this day, his wall clocks remain a refreshing alternative to the usual timekeepers. The L-shaped cabin is split into two wings—one for the active spaces and the other for the bedrooms. The master bedroom, bathroom, and a second bedroom/flex room reach toward the meadow. The kitchen, living room, and dining area are set back against the slope, and are attached to the utility room and garage. The hallway and deck sit between the two wings. The bedroom opens out onto the deck and meadow beyond. "Each facing side—meadow and slope—is deliberately distinct in materiality to emphasize this response to its immediate landscape," continues the firm. 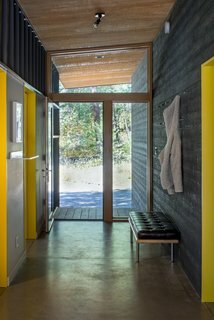 The doorways, painted a bright yellow, add a playful edge to the entrance hallway that doubles as the mudroom. A peek into the outdoor living area. The standing-seam metal that's used for siding here is also applied to the shed roofs. Plywood cabinetry and ceiling panels have been combined with white walls to create a clean kitchen setting. 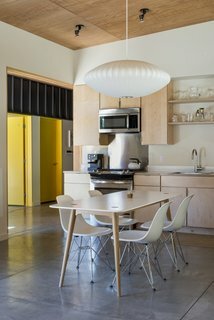 A Modernica Nelson Bubble Lamp hangs above the dining table. 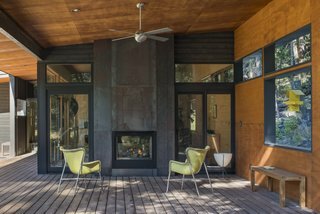 A double-sided fireplace divides the indoor living room from its "outdoor living room" counterpart. The fireplace is the Twilight Modern model from the Hearth & Home Technologies Outdoor Lifestyles collection.